Are you still striving for products of China tourist destinations and related tourism information? Are you still struggling to provide your clients a variety of high-standard China inbound tourism products that meet the market demand? Are you still looking for a one-stop platform to reach the right Chinese supply channels of airline, hotel, and local travel agencies? Here comes the opportunity for those who are ready. The media briefing of China (Haikou) Cross-Border Tourism Exchange (CCTE for short) was held on Jan. 8, 2019. 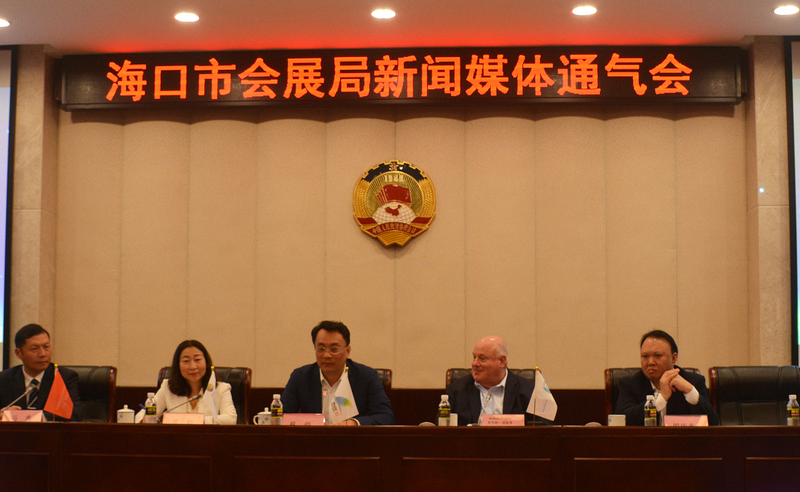 During the media brief Haikou was announced as the host city of 2019 CCTE. The 2019 CCTE will be co-hosted by Haikou Municipal Government and Department of Culture, Radio, Television, and Sports of Hainan Province, and organized by Haikou Convention and Exhibition Bureau, Haikou Tourism Development Commission and Beyond Summit Ltd. To be launched from Oct. 19 to Oct. 29 of 2019 at the Hainan International Conference & Exhibition Center, the CCTE is now open for international buyer registration. Different from the traditional way of holding event, the 2019 CCTE will combine the in-depth forum with tourism industry tradeshow. By integrating the forum with product customization, and the tourism promotion with FAM trips, CCTE is expected to weave different segments together to bring the travel operators an deep insight of the industry and a face-to-face trade fair. 2019 CCTE will be held in the charming coastal Chinese city Haikou, who owns international standard inbound tourism products, visa-free policy for guests from 59 countries, unique tropical natural views, and unforgettable cultural and historical stories. Moreover, it has the capability to hold international events with large influence and brand value. Haikou will embrace CCTE buyers from North America, Europe, Australia, etc., who come all the way to China to learn about the latest trend of inbound tourism market, to keep up with the industry development, and to contribute to the blueprint of China inbound tourism market. Join CCTE, you will enjoy the supreme accommodation service provided by the official hotel partner of CCTE during the event with a cost of only four nights’ charge (688 CNY per room/night, breakfast included). Join CCTE, you will enjoy the free local guidance during your stay in Haikou. Join CCTE, you will have the chance to attend the FAM trips in Hainan, Haikou, and other tourist destinations in China. Join CCTE, you will have the chance to be rewarded as an expert of China tourism destination and receive a certificate presented by China local government and China’s tourism platform. Join CCTE, you will be exposed to a variety of qualified regional interline products and will be provided an opportunity to work with local Chinese travel operators to develop China inbound tourism products that are more attractive in overseas market. Join CCTE, you will be exposed to the China inbound tourism market and communicate and trade with more than 300 Chinese sellers. Join CCTE, you can learn the latest trend of China inbound tourism, the demand of the market, and the business opportunities in the process of meeting the market demand. Join CCTE, you can cherry pick the qualified business partners and conduct a direct dialogue with Chinese sellers during the event. Aimed at meeting the actual demand of the cross-border tourism, CCTE will be a doze of stimulant for China tourism market. China (Haikou) Cross-Border Tourism Exchange (CCTE) will be more than an exhibition, a trade fair, and a forum, but a pragmatic gathering for global tourism that calls for your participation!